So… as an avid user of Twitter I noticed a few tweets going back and forth between Spence @Harbars and Brian @BrianLala about this tool on CodePlex called AutoSPInstaller. I have heard about it in the past but most recently and after speaking to Spence about what he ‘coined’ the Idiot Button i.e. 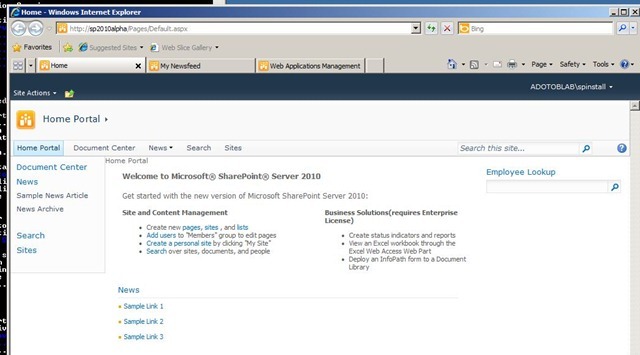 the Farm Configuration Wizard; I have been on the quest to find a way to automate creating Service Accounts after installing the SharePoint bits. 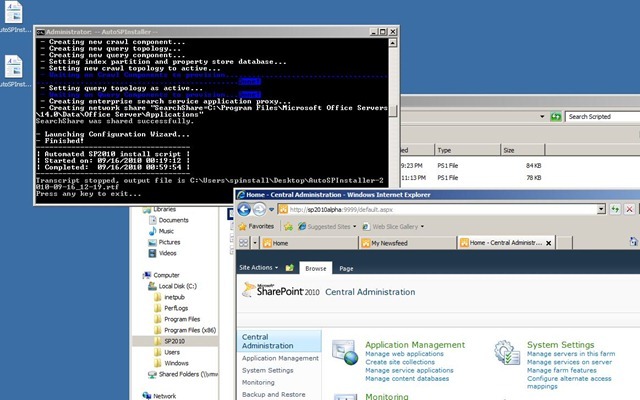 Spence does have a few blogs on the topic which i have used to great success, but in the end PowerShell is there for a reason, i just needed to know how to use it. 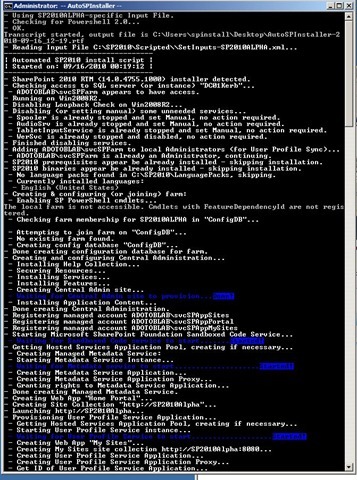 As a DEV, I wasnt looking forward to learning PowerShell, though i know I have to, but this #AutoSPInstaller utility allows me to cheat – at least for a time – and I get the best of both worlds. I felt it necessary to blog my experience because there are at least two gotchas that I am aware of but overall my experience was satisfactory. So after downloading the tool, the first thing i will encourage you to do is.. yes.. Read the “ReadMe” file that is included. It details what you need to do to fire off the script. The tool comes with a few XML files that you will have to modify; by that I mean, configure. However, these configuration steps is just a matter of providing nomenclatures for your Databases, your Account Names for Service Accounts, your Passwords for those accounts, and whether you want to install features by indicating 1 or 0 (zero). 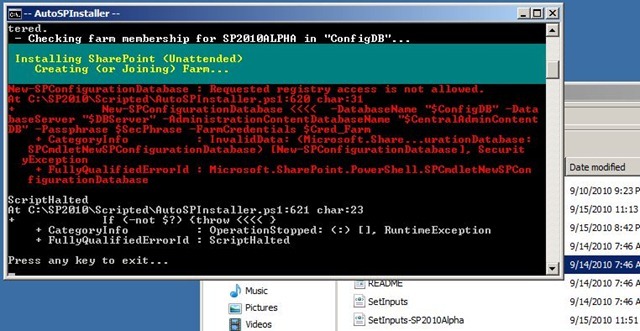 There is a Launch.bat file which executes the PowerShell (*.ps1) file; which inturn interrogates a Setup(optionalfilename).XML file for configuration specifics. In my modifications to my Setup.XML i also renamed to file to include the NETBIOS name of the Server, this allows me to have a specific file for each server in the Farm. The Second Gotcha I met was right after I executed the batch file. The error is below in the screen shot. So, I elected to make the changes to UAC because I also don’t like the interruptions when i am installing products. Below are all my Sites that were created. 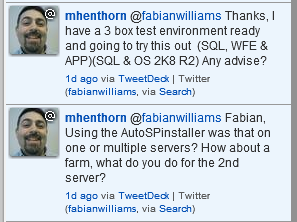 You are going to have questions on this blog, the first one may be..Well Fabian “What do i do if I wan to build out a Farm that Includes more than one Server (in-fact I fielded a question on Twitter already on this one).. Fantastic blog! I actually love how it is easy on my eyes as well as the information are well written. I am wondering how I can be notified whenever a new post has been made. I have subscribed to your rss feed which should do the trick! Have a nice day!